If you’re considering bringing a new dog or cat into your home, there’s no doubt that saving a life at your local city or county animal shelter is a wonderful way to go. But if you’ve never adopted from a shelter, you might be unsure of what to expect. First things first: Do your research.Spend some time looking at shelter websites and Facebook pages to see what animals are available for adoption. Check a shelter’s adoption requirements, so you can be prepared before you go to the facility. “There’s nothing more heartbreaking than falling in love with an animal and not being able to take him home,” says Emily Weiss, the ASPCA’s vice president of shelter research and development. Fill out an application, including the names and ages of the people living in your home and the health of current or previous pets you’ve owned. Some shelters also ask for references. 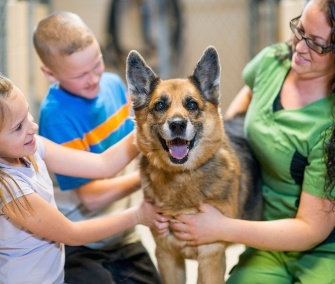 Provide your veterinarian’s contact information or even veterinary records. If you’re a renter or live in an association, you may need to provide a copy of your lease/condo agreement or your landlord’s name and phone number to verify that you’re permitted to have a pet (or more than one pet, if you already have one). Some organizations require a home visit (especially when you want to adopt a dog). Some also require a fenced yard for a dog; however, this is becoming less common, according to Weiss. It's also important that you know what traits you're looking for.Weiss says you should think through what you’re looking for in a pet before heading to the shelter, so you can articulate your desires to the staff. That “most important thing” varies widely. You may want an affectionate or playful pet. Or you might be looking for a pet who is happy going on long walks, is a certain size or loves kids. This information is very helpful to the staff member who’s assisting you in finding a dog or cat who’s the right fit.